We woke up EARLY to an absolutely BEAUTIFUL day here in Beijing. Love those days! Why so early? Well, Clark and Katie arrived this morning! they were scheduled to arrive at 5:20am, and got in about an hour early! … they had a series of ‘set backs’ before they made it to our house (including an ATM card lossage and a couple disgruntled taxi drivers)… but we were SO thrilled and happy to see them. We only have time for a pancake breakfast and quick showers before we were off on our way to the Olympic Green for the Trampoline competition. It was an even day, so no driving. We took the subway in, grabbed McD (I might need to swear that place off) and found our seats just in time for the 11am start. we only had 6 tix, for the 7 of us, so eric did some wheeling/dealing on the subway and scored not only an extra ticket to trampoline, but one for mtn. biking as well. We really enjoyed the trampoline stuff. They get SO high, and it’s really fun to watch. We watched the women and men’s qualifiers. It was in the Indoor Gymnasium where the gymnastics are held. The crowds were significantly greater today…everywhere. Might have been the beautiful weather. 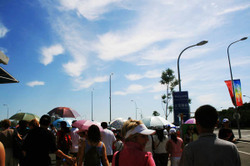 we left the Olympic area and went down to Wanfujing- which is a big shopping area.. like just for pedestrians. It’s always hoppin’. 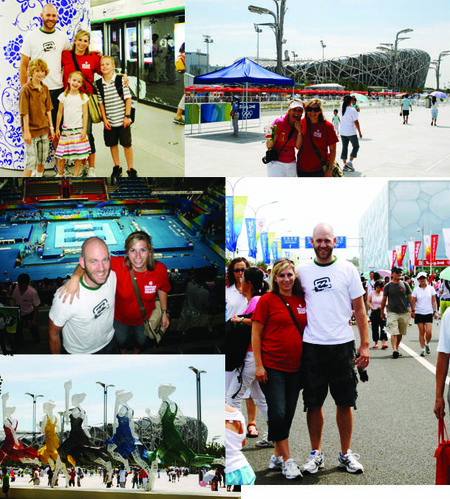 I really wanted to find Olympic t-shirts for everyone (I feel a christmas card photo coming on) but no luck… however, we were SUCKERED into all kinds of other Olympic merch. 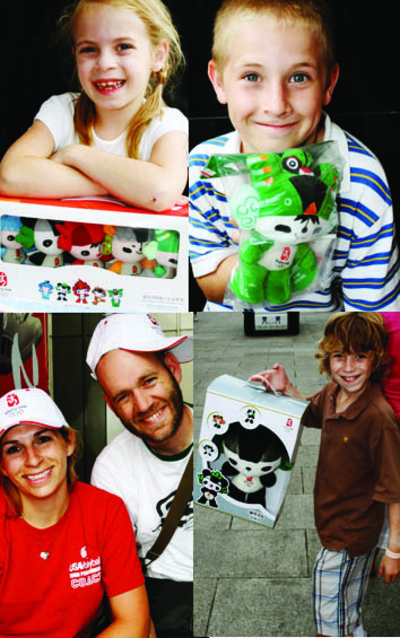 The kids really wanted mascot toys… so I didn’t realize that the names of the little cartoon characters are “beibei” “jingjing” “huanhuan” “yingying” and “nini” - the translations of their names is “bei-jing-huan-ying-ni”… or in English: Beijing Welcomes You! pretty cute. So… don’t worry, we are all set with t-shirts, hats, bracelets, and stuffed toys.